MSTW volunteers bring a wealth of energy and experience to their work with our company, and no one proves that point more than Costume Designer and Wardrobe Mistress Nancy Street. Nancy and her husband Kim purchased a home in Pioneer in 2003, and moved here permanently from the Bay Area in 2005. "My Dad lived up here for 20 years," she said, "and we came to love it." She and Kim have two grown children, Joseph and Emily. Joseph completes his Ph.D. this month at Stanford in Geology-Paleoclimatology. He and his wife, a teacher, are the proud parents of identical twin 4-year-old daughters. Emily lives in Marin County and, with her husband, owns a Pilates studio in Fairfax. That's an interest she shares with her mother, who is a Pilates instructor at New York Fitness and at Yoga Moment, and who also has her own private Pilates studio. But it was her love of costume that brought Nancy to MSTW. She started by assisting seamstress Susan Johnston. Then for a production of Gaslight, Artistic Director Susan McCandless needed a coat made for a character on short notice, and Nancy stitched it up to order. "After that, every time she needed a costume and it was for a big person who needed a pattern adjusted, she called on me," Nancy laughed. She quickly graduated to costume design for productions of Goldfish Bowl and Leaving Iowa, and most recently for the modern version of Taming of the Shrew. In fact, she has a long love affair with Shakespeare. When she was teaching 5th and 6th grades in Santa Cruz, she had the opportunity to work on a pilot program to bring Shakespeare's works to the classroom. The program became a success, allowing Nancy to incorporate Renaissance art, theatre, music, and dance into the curriculum. "The whole Shakespeare theme became integrated with what I was teaching," she explained. Now retired, she brings her considerable talent and energy to MSTW. The wardrobe is now in "wonderful, wonderful shape," she says, thanks to the efforts of Volunteer Coordinator Frannie Weinrob, Volunteers Linda Smith and Cathy McClellan and a cadre of other volunteers who organized all the gowns, hats, suits and accessories on racks and shelves in the space above the ticket office. "I love the theatre, I love costume," she says. "But one of the great joys for me is working with the actors - their joy, their energy, their spirit, their talent. It's invigorating! And the venue is wonderful." The next meeting of the Mother Lode Ragtime Society will be held at the Sutter Creek Ice Cream Emporium on September 15, 2012, from 7 p.m. until 9:30. Tom Brier will be on hand to provide lots of good music; but all who would like to play are welcome. September 8, 2012, Carl Sonny Leyland Boogie Woogie and Blues concert at the Hawthorne residence, 244 Folsom Road, in Roseville. $20 per person--all proceeds go to the musician. Doors open at 1:30 and concert begins promptly at 2 p.m. Seating is limited, so reservations are required. Please call 916.773.3562 or e-mail tom@thoseoldrecords.com for information and reservations. September 22 and 23 will be the weekend for two back to back concerts for Jeff & Anne Barnhart at Skunk Hollow, 50 Gold Dust Trail, Sutter Creek; if you can't attend Saturday's performance, come for the Sunday afternoon concert and see a completely different show. Or, stay overnight and see them both; each concert will be unique! Saturday's concert will begin promptly at 3 pm. A Pot Luck Dinner will follow Bring your favorite dish to share. Bring your instrument or grab one of the 5 pianos and join in with the evening afterglow. Guests traveling a long distance will be offered a room upstairs to avoid driving late at night and will wake up to a special breakfast to start the day. Sunday's concert will begin promptly at 3 pm. At the conclusion of the concert, a selection of hearty finger foods will be served. For more information, call 626.806.3021, or e-mail sutterchip@yahoo.com. Despite the hot weather, the 2012 Sutter Creek Ragtime Festival was great! It's never too early to start thinking about next year. 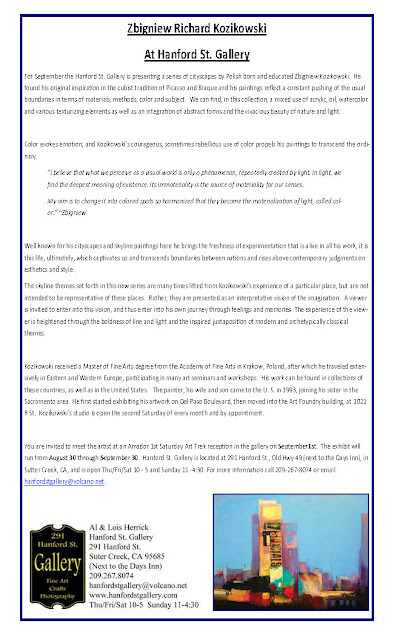 Dates are August 9 -11, 2013. Watch the website (www.suttercreekragtime.com) for information as it becomes available or call (209) 405-1563if you have questions. 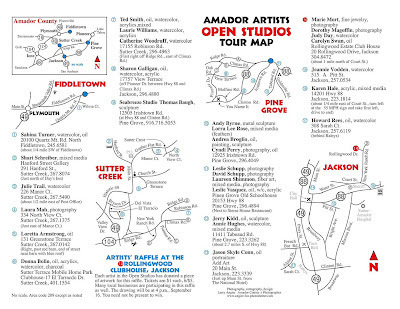 The next Amador 1st Saturday Art Trek will be September 1, from 1:00 to 7:00 pm at nine galleries in Amador County and the north part of Calaveras. Take a trek and see what each gallery is currently featuring. It might be an artist's reception, cookies and punch, wine and cheese, music, or simply staying open for an extra hour or two on this 1st Saturday evening. You’ll always have fun seeing what kind of art these galleries have selected to exhibit for the month and meeting others, like artists and art lovers. For September the Hanford St. Gallery is presenting a series of cityscapes by Polish born and educated Zbigniew Kozikowski. He found his original inspiration in the cubist tradition of Picasso and Braque and his paintings reflect a constant pushing of the usual boundaries in terms of materials, methods, color and subject. We can find, in this collection, a mixed use of acrylic, oil, watercolor and various texturizing elements as well as an integration of abstract forms and the vivacious beauty of nature and light. The skyline themes set forth in this new series are many times lifted from Kozikowski’s experience of a particular place, but are not intended to be representative of these places. Rather, they are presented as an interpretative vision of the imagination. A viewer is invited to enter into this vision, and thus enter into his own journey through feelings and memories. The experience of the viewer is heightened through the boldness of line and light and the inspired juxtaposition of modern and archetypically classical themes. 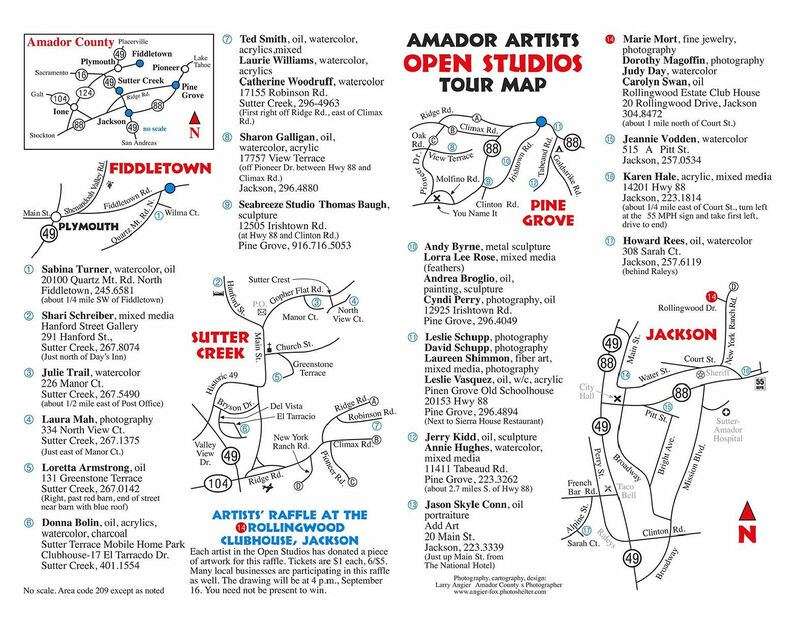 You are invited to meet the artist at an Amador 1st Saturday Art Trek reception in the gallery on September 1st. The exhibit will run from August 30th through September 30th. Hanford St. Gallery is located at 291 Hanford St., Old Hwy 49 (next to the Days Inn), in Sutter Creek, CA, and is open Thu/Fri/Sat 10 - 5 and Sunday 11 -4:30. This is a great opportunity for young musicians to participate in a group. Fun but challenging music is directed by Hank King with weekly practices starting late September and concerts scheduled for late January and early May. SACRAMENTO – The California Arts Council announces that the Calaveras County Arts Council will receive a 2011-12 Creating Public Value grant of $8,500. The Calaveras County Arts Council, located in San Andreas, was one of 77 organizations that submitted the strongest proposals to enrich their local communities through music, theater, visual arts, dance and other arts. The Calaveras County Arts Council will expand the "Ovations Performing Arts Series" so that artists booked for public performances can visit 10 local schools. These educational presentations will reach an estimated 3,000 K-12 students who would not otherwise have access to quality performing arts because of the isolated nature of the area and school cuts. The Creating Public Value Program's intent is to promote partnerships, lifelong learning, and the social and economic impact of the arts. Grantees demonstrated how they will support new and expanded programs to benefit the communities they serve through any of the following goals: supporting safe and creative opportunities for youth; fostering attractive and livable neighborhoods and communities; providing greater access to the arts for individuals, families and communities; and/or encouraging economic and community development. 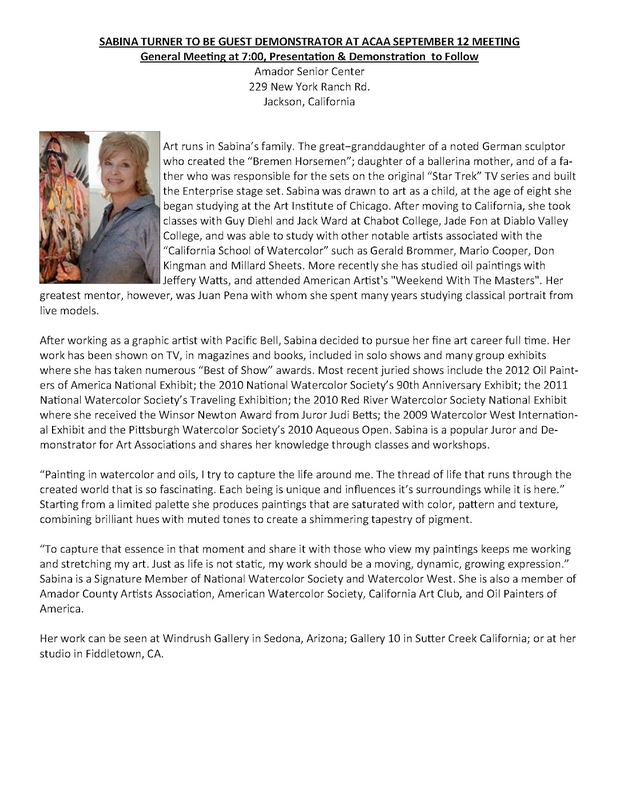 For more information about the Calaveras County Arts Council, please visit www.calaverasarts.org. For more information about the Creating Public Value program, contact the California Arts Council's Information Officer Mary Beth Barber at (916) 322-6588or mbarber@cac.ca.gov. Additional information may be found on the California Arts Council’s website at www.arts.ca.gov. The Amador Choraliers begin rehearsals September 4th for their winter concert season scheduled to perform in early December. They are looking for new voices, especially men! their music and often add props and a bit of choreography to their performances. They provide a broad repertoire of music appealing to a wide audience, including all genres: blues, jazz, gospel, country, classical, big band era, rock and roll, and folk. They also may include music from Broadway, the movies and television. Rehearsals are weekly on Tuesdays from 6:30-9:00 at the Amador High School Band Room in Sutter Creek. The group is also looking for another pianist and technical persons (lighting & sound). A native of Northern California, Jimmy Grant grew up in a household full of rich musical influences that inspired a passion for the music of Django Reinhardt. While his influences grew to include Russian Folk, Bluegrass, Celtic and Classical, he continued to develop the gypsy jazz technique. He has studied with acclaimed guitarists such as Jim Nichols and Andreas Oberg, and has performed with artists such as David Grisman, Ludovic Beier, George Cole, Simon Planting, Tommy Davy, Gonzalo Bergara and the Hot Club of San Francisco. This is a fund raiser for the Amador County Library. Cost - $35 (tax deductible) paid when registering. Make checks payable to: The Friends of the Amador County Library. Registration – until October 5, 2012, at the library. When – Saturday, October 6, 2012, from 10 a.m. to 4 p.m. Please bring an apron and small brushes if you have them. Be sure to wear old clothes. There will be ART GOURDS for sale at the workshop. Jackson, CA – One of today’s top touring rock bands, The Guess Who, will perform their greatest hits at Jackson Rancheria on Friday, October 12. The show is at 7 p.m. in the Grand Oak Ballroom at the Hotel. Must be 21 to attend. Food and beverages will be available. Tickets are $40 and are available at the Casino Cage and JacksonCasino.com. Dreamcatcher’s Club® members can get discounted tickets for just $20 only at the Casino Cage. All seats are general admission. The Guess Who originally formed in Winnipeg, Manitoba more than 40 years ago. The group fostered a sound and a following that continues to this day, evidenced by their successful and busy tour schedule. In addition, the continued success of classic rock stations throughout the United States has helped to broaden the base of the group’s loyal followers. Over the years, the band’s music has incorporated blues and folk influences into its rock melodies. In 1987, The Guess Who was inducted into the Canadian Music Hall Of Fame.For more on The Guess Who visit theguesswhocafe.com. Jackson Rancheria Casino Resort is located at 12222 New York Ranch Road, Jackson, CA 95642. 800-822-WINN (9466), JacksonCasino.com.Located in the Sierra foothills town of Jackson, CA, Jackson Rancheria Casino Resort is owned by the Jackson Rancheria Band of Miwuk Indians, a federally recognized Indian tribe. A sovereign government, the Rancheria is dedicated to developing projects that not only enhance the tribe’s ability to remain self-reliant, but also reflect a commitment to be a good neighbor. JACKSON, CA – One of today’s top touring rock bands, WAR, will perform their greatest hits at Jackson Rancheria Casino Resort on Saturday, November 3. The show is at 7 p.m. in the Grand Oak Ballroom at the Hotel. Must be 21 or older to attend. Food and beverages will be available. Tickets are $40 and are available at the Casino Cage and JacksonCasino.com. Dreamcatcher’s Club® members can get discount tickets for just $20 only at the Casino Cage. All seats are general admission. WAR, the original street band, was the brainchild of veteran record producer Jerry Goldstein and rock legend Eric Burdon (former lead singer of The Animals). Eric parted ways with the band in 1979 and WAR went on to assert their own history. That history includes decades of hits including “Low Rider,” “Cisco Kid,” “Why Can’t We Be Friends?,” “The World is a Ghetto,” “Slippin’ into Darkness,” “Spill the Wine” and so many more. For more on WAR, visit war.com. With strong influences from old-school Chicago Blues and West Coast Jump, The MoFo Party Band is headed by the Clifton Brothers: John - blowin' harmonica and growlin' vocals, and Bill - pickin' licks on his Tele. Performing over 150 shows yearly since 1989, The MoFo Party Band is known for its energetic live performances, dynamic stage presence and loyal fan base. The MoFo Party Band has recorded five highly acclaimed albums which have received national and international airplay. The 2006 release “The Sound of the MoFo Party Band" ranked #2 on the CD Baby "Top West Coast Blues Album" list and was awarded a 5 Star Rating by Big City Blues Magazine. The MoFo Party Band has played many high profile shows including the San Francisco Blues Festival, the BB King Blues Festival with Johnny Lang and the Fabulous Thunderbirds and Mark Humel's Harmonica Blow Out with James Cotton and Huey Lewis. They have also worked as a backing band for such great blues artists as harp-master Johnny Dyer, the great James Harman, and the late Little Walter guitarist Luther Tucker. The Band has also been invited to play an outstanding 8 consecutive years at Central California's #1 Blues Festivals Fire On the Mountain's Sonora Blues Festival. No band has ever appeared that many times. From their Retro look, dynamite stage show, and fresh lively blues grooves, the MoFo Party Band is considered one of the most original and well received acts on the music scene today. They blew the roof off last time they were here, come on down and have some fun! At its final T.G.I.F. concert of the season AmadorArts announced the 2012 Patron the Arts awards. The prestigious honor was presented to Al and Lois Herrick, owners of The Hanford St. Gallery, and to Jack Mitchell, publisher of the Amador Ledger-Dispatch. 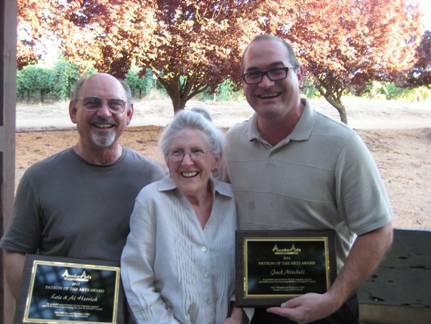 Each year AmadorArts recognizes community members who stand out for what they have done for the arts in our county, giving time and energy to promote, encourage and support the arts in Amador County. Al and Lois Herrick are a great team who have made Hanford St. Gallery not only a beacon for the arts in Sutter Creek, but for the entire region. Their gallery, which is located at 291 Hanford St., old Highway 49, next to Days Inn, features each month a different artist with unique quality. They’ve been donating a percentage of their gallery earnings each month to ASAF which now has become part of AmadorArts. The First Saturday Art Trek was their idea to foster a spirit of collaboration with other galleries, artists and the art community in general. Their gallery hosted the Amador County Artists Assoc. Student Art Show for Amador High this year, and last year after Cabaret, our Art Deco Student Show. Lois participated as one of the Art X the Inch mural artists working with high school students. The Herrick’s moved from the Bay Area 36 years ago settling in the Shenandoah Valley, taking one 3-year break to live in San Francisco. After helping their son open Chaos glassworks, they refurbished the old Sutter Diner which sat idle after a fire. The effort culminated with the opening in April of 2011 of the Hanford St. Gallery. Lois has spent a lifetime in the arts, from studying art at UCLA, San Francisco Academy of Art, San Francisco Art Institute, plus many years in the commercial arts field in New York and L.A. Throughout, she has continued drawing and exploring painting techniques. Al spent 30 years as a ship's engineer and another 10 years in the non-profit world of homeless shelters and hospice service and tries to find time to work on his digital photography. Jack Mitchell is an innovative entrepreneur and an important arts supporter as he fills the pages of his papers and on-line sites with continuous year-round coverage of all the arts in our area. He oversees the Friday Ledger-Dispatch, the mid-week Goldmine, and the www.ledger-dispatch.com which has over 300,000 pageviews and averages over 80,000 visits. The sister website, www.myachome, provides an interactive social media allowing businesses to connect and hold conversations with their customer. Jack is not one to just sit behind a desk. He’s out and about stating the case for Amador and changes in the world of communications. His paper earlier this year was named by Editor & Publisher as one of “10 Newspapers That Do it Right.” Just a few days ago, Jack was quoted in the San Francisco Chronicle about the Lincoln Mine set to open this fall. He sees the value of community interaction by covering, among many subjects, the arts. He and his competent staff provide invaluable assistance in helping AmadorArts and other arts organizations to get the word out about the good work we all do to enrich the lives of residents and visitors. The band will play tunes of the 1920’s and 30’s using original band instrumentation, vintage music arrangements of the era, and features band vocalists Chrissy Sleigh, Eric Johnson, Arlene White, Jeff Chambers, and Tom Sharkey! The Orchestra (SJO) has appeared this last year at Ironstone Vineyard’s Concours d’ Elegance, the Dante Club in Sacramento, at ACRA’s New Years Eve party at Pokerville Hall, and made special appearance at the Berkeley City Club. $5 admission at the door. A portion of the proceeds will be donated to the Amador Senior Center. Amador High School Band Boosters will have a wonderful dessert table for your enjoyment as well as complimentary coffee. The Senior Center has great parking and access! See you Sunday August 26 for a fun afternoon and set your calendars back to the 1920’s! Classic cars and authentic attire are welcome. Come support music in Amador County. Visit Speakeazy Jazz Orchestra’s updated website at HYPERLINK "http://www.speakeazyjazz.com" www.speakeazyjazz.com or call 295-4305 for more information. We have featured instrument making workshops for kids at the Jug Band Festival in Sutter Creek, where kids make kazoos, shakers, etc, and do a little warm up and then join some of the jug bands on stage. Unfortunately our usual teachers have had to cancel at the last minute and the festival is coming right up on Saturday the 18th, 11am to 9pm at the Sutter Creek Inn, Main Street Sutter Creek. Sue Slivak suggested several who might be able to help us out, but they weren't available and they suggested I send out an SOS on Loraine Davis' network. So, could you, whoever you might be, do it and would you have materials at hand? If not, we would defray any costs for materials that you might need to get. Sorry for the extremely last minute notice, but anyone who can help out will be greatly appreciated - plus, in all honesty, it is a heck of a lot fun. If you can, or know of anyone else you think of could, help please contact me at 267 5967 or the above email. Don’t forget! Put this on your calendar: the next Arts Networking Open House is on Thursday, August 23 from 6:00 to 8:00 pm. For AmadorArts members, the event is FREE; or it’s just $5 a person. Everyone welcome! The location, which changes each time for this quarterly event, will be in Ione at Clark’s Corner, “the busy place whose menu offers food and drink and the main course is community.” Described as a Mixer for the Arts, guests mingle while enjoying the themed-event, this time featuring Dance. Complimentary appetizers and a no-host wine bar make coming to an Arts Networking mixer a friendly, fun, and casual experience. A raffle of original art is another plus. Featured will be demonstrations in contemporary, tap, and hip-hop by students of The Studio Performing Technique Dance School. The Studio operates its classes and training at a state-of-the-art facility in Martell and attracts all ages of locals who love to be physically fit and express themselves through dance. At any of these arts networking mixers, expect to see a variety of people. Of course artists of all types attend, but many others do too, who just like to meet and have fun. Clark’s Corner is at 12 W. Main Street, in the center of Ione. JACKSON, CA – 38 Special will bring their signature blast of Southern Rock to Jackson Rancheria on Sunday, September 30. The show is at 6 p.m. in the Grand Oak Ballroom at the Hotel. Must be 21 to attend. Food and beverages will be available. Tickets start at just $20 for Dreamcatcher’s Club members or $40 for non-members and are available at the Casino Cage and JacksonCasino.com. The group is best known for arena-rock pop smashes including, “Hold On Loosely,” “Rockin’ Into the Night,” “Caught Up in You,” “Fantasy Girl,” “If I’d Been the One,” “Back Where You Belong,” “Chain Lightnin’,” “Second Chance,” and more, timeless hits that are immediately recognizable from the first opening chord. Moffatt and keyboardist/vocalist Bobby Capps. 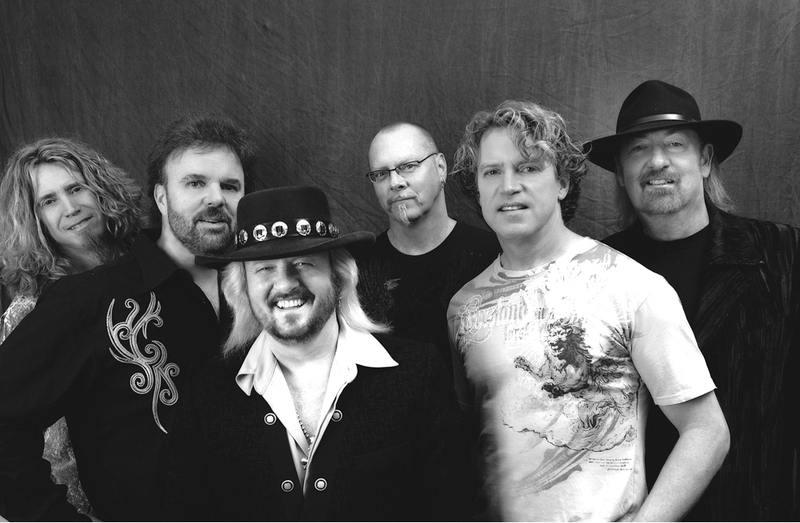 For more on 38 Special, visit 38special.com. Jackson Rancheria Casino Resort is located at 12222 New York Ranch Road, Jackson, CA 95642. 800- 822-WINN (9466), JacksonCasino.com. Located in the Sierra foothills town of Jackson, CA, Jackson Rancheria Casino Resort is owned by the Jackson Rancheria Band of Miwuk Indians, a federally recognized Indian tribe. A sovereign government, the Rancheria is dedicated to developing projects that not only enhance the tribe’s ability to remain self- reliant, but also reflect a commitment to be a good neighbor. the Casino Cage and JacksonCasino.com. versatility. Dierks has had eight number one singles and written every one of them. He’s performed at Lollapalooza, the Telluride Bluegrass Festival, Bonnaroo and the CMA Music Festival, tailoring his sets to each. His instantly recognizable voice and acoustic/electric hybrid sound have propelled him to membership in the Grand Ole Opry and a performance at the White House, all made possible by his devotion to developing all sides of his musicianship. For more on Dierks Bentley visit dierks.com. 822-WINN (9466), JacksonCasino.com. Located in the Sierra foothills town of Jackson, CA, Jackson Rancheria Casino Resort is owned by the Jackson Rancheria Band of Miwuk Indians, a federally recognized Indian tribe. A sovereign government, the Rancheria is dedicated to developing projects that not only enhance the tribe’s ability to remain self- reliant, but also reflect a commitment to be a good neighbor.